Q: David, I understand that VMF Capital is a synthesis of two former firms. Please tell us about them and also why you decided to start a new investment firm. A: David: The initials VMF stand for Van Meter, Myers and Flynn, three of the four founders of the firm. The three, plus Karen Green, were part of the equity team at AEGON USA, Inc., the U.S. operation of AEGON, NV, one of the ten largest insurance holding companies in the world. In 1998, the four took an entire team of 17 people out of AEGON and established an independently owned registered investment advisor. One year after the start-up, VMF took on four new partners who had been part of Norwest Investment Advisors, Inc. in Des Moines, Iowa. The addition of the Des Moines office broadened the firm’s offering of investment strategies. Whereas the Cedar Rapids office offered large-cap value, mid-cap and small-cap strategies, the Des Moines office was able to fill in with large-cap growth and fixed income expertise. Q: What kind of success have you had retaining clients during your transition? A: When VMF Capital left the AEGON family, it was able to transfer more than 95 percent of the accounts and assets under its management. The Des Moines group was not able to bring its account base with it, but over the following two years was able to pick up many of its previous clients. Q: Please describe VMF’s mission statement. A: We strive to provide outstanding customer service; to develop lasting relationships with clients based on understanding, respect and trust; and to manage our clients’ investments in such a way that the investments target returns are comparable to the market in general but at significantly lower risk. Q: What kind of investment strategies do you offer clients? A: We offer a broad range of strategies: Large-Cap Value, Large-Cap Growth, Mid-Cap, Small-Cap, Select (an all-cap strategy), Fixed Income, Liquidity Management and balanced strategies using any of the equity strategies in conjunction with the fixed income strategy. Q: David Kaplan, as portfolio manager of your Small-Cap Core equity composite, what is so attractive about this particular segment of the market and what percentage of a diversified portfolio should be invested in small-cap stocks? A: Despite more than two years of outperformance in small-caps, we think there are good opportunities for further outperformance. Small-caps have a long way to go to catch up with large-cap stocks after their underperformance in the early and mid-1990s. We believe investors are still shifting assets from large-cap growth mutual funds and index funds that were extremely over-owned in the late 1990s, which should help small-cap investors. Furthermore, small-cap valuations are very reasonable, particularly with this year’s sell-off, and should see earnings growth greater than that of the S&P 500. With this in mind, we believe a diversified portfolio should have at least 15 percent exposure to small-cap stocks. Q: I understand that you made a transition in the last couple of years in managing small-cap stocks. Please explain when this happened and the major differences between the old and new approaches. A: VMF Capital has a long history of managing small-cap portfolios. Tom Myers, currently VMF Capital’s Mid-Cap manager, ran our Small-Cap strategy from 1991 to 1998 and had very good results. 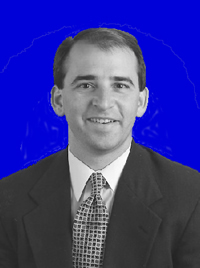 Scott Hassenstab, no longer with VMF Capital, managed the Small-Cap strategy from 1998 to June of 2000. Following Scott’s departure, we changed the approach of the Small-Cap strategy from a pure “bottoms up” approach to an investment process based on the combination of a quantitative screen and fundamental research. I was named the portfolio manager in July of 2000, so that would be the starting date for our new investment approach. Q: Is this an approach you brought to VMF or something that you more recently developed? A: I joined VMF Capital in December 1998 as an equity analyst. VMF Capital did not use quantitative tools in its investment process prior to my arrival. We made this change in our investment process because we thought it would improve our performance while better utilizing the firm’s resources. Q: For small-cap core investing, what are the general ranges in capitalization of your portfolios’ positions? A: We define our investable universe as the Russell 2000 and the Standard & Poor’s 600 indexes. We start with a capitalization range of $250 million to $2.5 billion. The median market capitalization of the portfolio is currently $550 million. Q: Tell us about your quantitative screens and how they work. A: We developed our quantitative screen with help from the Applied Finance Group (AFG). We use AFG’s ValueExpectations™ software, which allows us to understand the market expectations built into a company’s stock price by comparing value drivers such as sales growth and EBITDA margins to market value. This software calculates a company’s economic margin, which is a major factor in our quantitative screen. We define economic margin as simply a company’s cash-on-cash return on investment less the company’s cost of capital. All companies that we purchase must generate a positive economic margin; we call them “value-creating” companies. We favor companies that, today, generate cash flow from their assets that exceeds their cost of capital. This eliminates turnaround stories from consideration. Our screen also favors companies that are expected to show an improvement in next year’s expected economic margin, which is calculated based on the company’s current asset growth, analyst estimates, and how accurately the software has tracked the company in the past. One other factor in our quantitative screen is a valuation factor. Each company we purchase must trade at a discount to intrinsic value. We calculate an intrinsic value based on next year’s expected economic margin. We then compare the upside potential to intrinsic value with other companies in the same industry. Q: How does your quantitative screen differ from other quantitative strategies? A: We wanted to make our investment process proprietary by including fundamental analysis in our investment process; other quantitative strategies are more “black box”-oriented. We believe that a shortened list resulting from our quantitative screen, together with rigorous fundamental analysis, increases the likelihood of better stock selection. Our screen ranks the companies in our investable universe on a scale of 1 to 6, with a score of 6 being awarded to the companies that meet all six of our quantitative criteria. Using our six-factor quantitative screen, our investable universe is narrowed from 2,000 companies to 150 to 175 companies. We then do fundamental research on this shortened list to construct our portfolio, which will consist of 45 to 55 companies. Several other components of our investment process are proprietary. First, we rate our existing portfolio on our quantitative criteria weekly. If we own a company that approaches its intrinsic value, its quantitative ranking will start to deteriorate. Second, we won’t necessarily sell a holding if its quantitative rank deteriorates, but it is the starting point behind additional fundamental analysis to determine if additional upside potential exists. We usually reduce our weight in the position to at least 2 percent to respect what our quantitative work suggests and then use the proceeds on a better-scoring alternative. Q: Please explain how you use quantitative screens to find companies that are undervalued based on peer group analysis. A: As I have discussed, our quantitative screen favors companies that sell at a discount to intrinsic value. We compare this upside potential to what we could achieve with other companies in the same industry. However, a discount to intrinsic value is not sufficient unless the software has historically been accurate with its predictions for a particular company. This accuracy factor is based on how well the software has tracked prior stock performance based on prior predictions of economic margin. In the case where it has not been accurate with its prior predictions for a company, we would be less confident of our intrinsic value calculation and would eliminate the company from consideration. So not only do we want to see upside potential greater than the peer group, but we want ValueExpectations to have done a good job of forecasting prior stock performance. Q: What kinds of fundamental factors help determine your investment decisions? A: Our fundamental research occurs after our quantitative screen has narrowed our investable universe. We operate with the belief that we want to buy what our quantitative model suggests, but only those companies that satisfy our fundamental criteria. Our fundamental analysis consists of a review of the financial statements, competitive environment and management. We spend a lot of time analyzing the balance sheet, income statement, and cash flow statements. On the balance sheet, we avoid highly leveraged companies with high capital expenditure requirements. We also monitor accounts receivable and inventory turnover. On the income statement, we want to see improvement or at least sustainability of operating margins. On the cash-flow statement, we compare cash from operations to net income and also the trend in operating cash flows. We want to see a management that has good control of its business, which is exemplified by growth in revenues and operating cash flows and the ability to sustain operating margins. We find that an economic margin framework summarizes these factors nicely. We also review sell-side research reports to understand the business model and management’s competitive strategy. We often compare management’s strategy with historical performance to get a better understanding of management’s track record. We avoid companies that have historically underperformed over long periods of time. We also like to own shareholder-friendly companies, so we prefer insider ownership and avoid companies with large amounts of insider selling. Finally, one other important factor for us is to invest in companies that are run by management with high credibility on Wall Street. Once we find companies that meet our fundamental criteria, we use ValueExpectations software to analyze market expectations based on today’s price. We input our assumptions about a company’s revenue, EBITDA and asset turnover to calculate our own intrinsic value. In summary, our fundamental research has many components, but it operates with the belief that our quantitative model drives what companies we own. So our work is focused on using our shortened list to find those companies that meet our fundamental criteria. Q: Does your approach favor “value” (low p/e) over “growth” (high p/e) stocks or does your analysis find reasons to invest in either style? A: On the surface, our quantitative screen might seem to favor only value stocks, yet we also own many growth companies in the portfolio. We want to own growth companies, particularly if these companies sell at a discount to intrinsic value based on next year’s economic margin and on comparisons to the peer group. We manage the Small-Cap portfolios with a “core” emphasis, but we will shift from value to growth based on the output of our quantitative screens. For the majority of 2001, we were correctly overweight value versus growth as a result of our quantitative work. At the time, our screen favored small banks, selected industrials and healthcare companies and, importantly, did not favor technology companies. Our underweight in technology and a value emphasis helped us substantially outperform in the challenging third quarter of 2001. This more defensive stance penalized our performance in the fourth quarter of 2001, when growth substantially outperformed value. Today, the weight of value versus growth in the portfolio, using statistics from Frank Russell, is approximately 55 percent value/45 percent growth. I envision the portfolio in the next 12 months moving to a 50/50 blend, given how poorly small-cap growth has performed, but this could change depending on the outcome of our quantitative work. Q: How do you measure risk, and do you ever adjust your portfolios to be more or less aggressive? A: We measure risk in two fashions. Portfolio risk, in the sense of out- or underperforming our benchmark and our competition; and stock risk, or the downside risk of each holding and its subsequent impact on performance. We address our portfolio risk by comparing our performance to our benchmark and the Lipper Small-Cap Core Universe quarterly. We rely on Zephyr Analytics software, which analyzes our portfolio in terms of standard deviation, alpha and beta. Since we are a core strategy, we also compare our returns to small-cap value and small-cap growth peers to get a better opinion of whether the portfolio should be more or less aggressive. Over the last 12 months, the portfolio has been properly positioned for value’s outperformance over growth. However, we prefer our core philosophy so we can adjust to whatever style is more in favor. We will adjust our portfolios to be more or less aggressive based on the outcome of our quantitative work and other research tools. The second risk is individual stock risk. We also have tight parameters to control this risk. We own 45 to 55 companies, each starting with a 2 percent initial position. We automatically trim a position if it gets to a 4 percent weight. We don’t have set rules for selling a stock if it is down by a certain amount. Instead, our selling decision is dependent on our quantitative data and fundamental research. We will sell a holding if there is a mistake in our fundamental analysis, or if there are accounting issues or other events that would make us question management’s credibility. Q: Do you have a newsletter that updates your strategy on the market, and, if so, how can someone receive it? A: We publish quarterly updates in which we discuss our investment outlook. All portfolio managers discuss quarterly performance and portfolio strategy. We also have a Web site, vmfcapital.com, which enables the viewer to review portfolio summaries and other important information. Q: Do you generate your research internally or do you use outside sources? A: The fundamental research for our Small-Cap portfolio is a combination of internal and external sources. We use various software products to do our own analysis of a company’s cash flow, balance sheets and income statement. We also use ValueExpectations to perform sensitivity analysis, with particular focus on what market expectations are built into a company’s stock price. We review sell-side research to get a good background of the companies that we own. When we talk to analysts, we focus on issues that could pose a risk to the investment thesis. In particular, we want to avoid controversial companies suffering from investor disinterest, questionable accounting or poor financial controls. Due to these issues, we are constantly eliminating companies that our quantitative screen favors. Q: Is your investment approach adaptable or do you try to keep your approach consistent by adhering to a strict investment model? A: I think our approach is adaptable because it starts from the output of our quantitative screen. As long as the companies that are performing well in the market look favorable within an economic margin framework, then we will own those types of companies, growth or value. In a market environment similar to that of 1998-1999, where many unproven companies led the market advance, I expect we will underperform because the economic margin framework won’t be working as well. Fortunately, I don’t think we will see anything of the magnitude that we witnessed in 1998 and 1999, which I think favors our “core” philosophy. Q: How important is diversification, and how does your system ensure that you are not overly concentrated in a particular market sector? A: VMF Capital has sector diversification guidelines that require us to own 50 to 150 percent of each sector weight within our respective benchmarks. For example, if the weight of the technology sector in the Russell 2000 Index is 17 percent, our small-cap portfolio must have technology exposure between 8.5 percent (minimum) and 25.5 percent (maximum). Our guidelines ensure that we have broad diversification and manage the portfolio with a core philosophy. Other controls that we have in place include biweekly portfolio meetings with VMF’s other portfolio managers to review performance and holdings. Q: What is your target market with your small cap strategy? A: We are targeting the institutional market with our small-cap product. For our Small-Cap strategy, our minimum account size is $500,000. We also offer a combined Small- and Mid-Cap strategy, which has a lower minimum, which I jointly manage with Tom Myers, VMF’s Mid-Cap portfolio manager. DONALD E. FLYNN is the CEO of VMF Capital. He joined VMF’s predecessor, AEGON USA Investment Management, Inc., in 1988. While at AEGON he was responsible for the firm’s client contact program, equity portfolios and external money management business. He is a member of the Association for Investment Management and Research. MICHAEL VAN METER is a Managing Partner and directs the overall investment strategies for VMF’s Balanced Value and Large-Cap Value styles. Prior to becoming a founding partner of VMF Capital, LLC, in 1998, Mr. Van Meter was with AEGON USA Investment Management, Inc. He joined AEGON in 1989 when the company acquired Perpetual Investment Advisors, where he was president and managing partner. THOMAS E. MYERS, CFA, is a Managing Partner for VMF Capital, LLC. He manages the Mid-Cap Equity strategy and also provides equity research and analysis for the other VMF strategies. In 1998, he became a founding partner of VMF. He was with AEGON USA Investment Management, Inc. for the 11 years prior to that. In 1992, he earned his Chartered Financial Analyst designation. JON K. AUGUSTINE, CFA, is a Managing Partner. He manages the Core Forty investment strategy and provides equity research and analysis for balanced institutional portfolios. Before joining VMF Capital he was a managing director of Norwest Investment Advisors, Inc. and a vice president of Norwest Bank Iowa Investment Management and Trust. Prior to his career at Norwest, Mr. Augustine was an equity analyst and portfolio manager at AEGON USA Investment Management, Inc. from 1989 through 1991. He earned his Chartered Financial Analyst designation in 1985 and is a member of the Association for Investment Management and Research. DON S. MEARS is a Managing Partner, manages the Investment Strategy for Fixed Income, and manages balanced institutional portfolios. Prior to joining VMF Capital he was a managing director of Norwest Investment Advisors, Inc. Mr. Mears served as vice president and chief investment officer for Norwest Bank Iowa Investment Management and Trust from 1978 through 1998. He is a member of the Association for Investment Management and Research. SCOTT D. ELTJES, CFA, FLMI, is a Managing Partner, manages balanced and fixed income portfolios, and is an integral member of both the Core Forty and Fixed Income strategies. Prior to joining VMF Capital, he was regional managing principal for Wells Fargo Institutional Trust Group and managing director of Norwest Investment Advisors, Inc. He also worked as a pension consultant at Principal Financial Group (1988 to 1993). Mr. Eltjes is a Chartered Financial Analyst and a member of the Association for Investment Management and Research. CHRISTOPHER C. COOK, CFA, is a Managing Partner, is responsible for managing the VMF Select investment strategy, and is an integral member of both the Core Forty and Fixed Income strategies. He came to VMF Capital from Norwest Investment Advisors, Inc., where he served as portfolio manager. He earned the designation of Certified Management Accountant and passed the Certified Public Accountant examination. Mr. Cook is a Chartered Financial Analyst and a member of the Association for Investment Management and Research. DAVID E. KAPLAN, CFA, manages the Small-Cap strategy and assists with research and analysis for the other VMF strategies. He came to VMF Capital in December of 1998 from Summit Capital Management, where he was an equity analyst and trader. Prior to his employment at Summit he worked as a financial analyst for various investment banks. He earned his Chartered Financial Analyst designation in 1998.